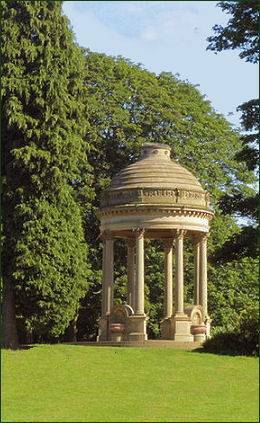 Roundhay Park in Leeds is one of the biggest city parks in the whole of Europe. It has more than 700 acres (2.8 km2) of parkland, and is owned by Leeds City Council. The park features the Explorer's cafe, woodland, gardens, playgrounds, a skate park, visitor centre, lakes, streams and even has a canoe club. The park contains some superb floral displays in the specialist gardens which include the Monet Garden (below right), which is based on gardens planted by the impressionist at Giverny in France, was introduced to the park in 1999 and the adjoining Alhambra garden, based upon one of the worlds most famous gardens, the thirteenth century garden at Alhambra, in Spain. 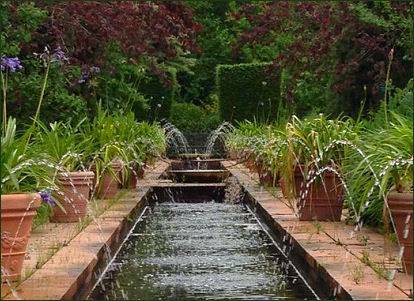 There are also four gardens that have previously been exhibited at the Chelsea Flower Show. Canal gardens (right) lies next to Tropical World and contains ornamental wild-fowl, a fountain and a Spirit of the Earth statue. It was formerly a vegetable garden for the mansion. 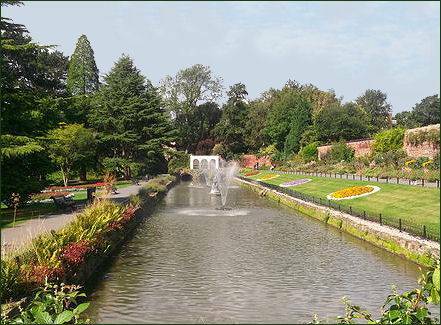 There are also specialist gardens in the Canal and Coronation Gardens off Princes Avenue by Tropical World. The Coronation Garden is home to our winning entries to the Chelsea Flower Show. Formerly a kitchen garden there are thousands of rose trees and bedding plants. The rest of the site offers a wide range of opportunities for recreation including walking and running routes, football and cricket pitches, tennis courts, a golf course, a skate park and bowling greens. Visitors to the park will find an abundance of wildlife including woodpeckers, common warblers in spring and summer, mute swans, visiting whooper swans, great-crested grebes and herons. Mammals include foxes, roe deer, voles, moles, rabbits and grey squirrels. The park is one of the most popular attractions in Leeds, nearly a million people visit each year. It is situated three miles north of Leeds city centre, on the north-east edge of the city, bordered by the suburb of Roundhay to the west and Oakwood to the south. Tropical World within the park features a butterfly house and aquariums. There are many birds and some reptiles living free inside, and many other animals in enclosures including a popular group of meerkats. A nocturnal house has creatures such as bats which are active at night. In 2015 following further refurbishments a new Aztec zone opened that included the aquarium area being transformed into a new Amazon themed zone where visitors can see new residents including piranhas and salamanders. The park has along history, the lands on which it stands were in the eleventh century granted to Ilbert De Lacy by William the Conqueror for his support in the Harrying of the North in the winter 1069-70. De Lacy, the founder of Pontefract Castle, originated from Normandy. During the thirteenth century, the area was used as a hunting park for the De Lacy family who were the Lords of Bowland. Roundhay later passed to John of Gaunt, Duke of Lancaster and then to his son, King Henry IV. In the sixteenth century King Henry VIII granted the park to Thomas Darcy. Through succession and marriage, it was acquired by Charles Stourton (1702-1753) in the eighteenth century. In 1803, Charles Stourton's nephew sold the estate to Thomas Nicholson and Samuel Elam. Nicholson then took the northern part which became Roundhay Park. Nicholson's land had the remains of quarries and coal mines. He disguised these by constructing the Upper Lake and the Waterloo Lake. The mansion house was built between 1811 and 1826 with a view over the Upper Lake. Nicholson constructed a castle folly.The Nicholson family were also responsible for building the Church of St John, almshouses and a school on the south side of the park. The estate eventually passed to his nephew William Nicholson in 1858 and was purchased by a group including the Mayor of Leeds, John Barran. Leeds City Council purchased the land and gave the estate to the people of Leeds as a public park. The park was officially opened by Prince Arthur, Duke of Connaught n 1872.